Offerings on the island of Bali in Indonesia are an artistic tradition for Hindu-Buddhist religious events, rites of passage, ancestral worship, and animistic ceremonies. Palm leaves, flowers, fruits, rice, and meat are shaped and assembled into an enormous variety of symbolic forms, special colors, and specific amounts that are defined according to Balinese cosmology. There are many variations across the island, from village to town to city to region. After the invisible spiritual essence of the offering is offered and consumed by the deities and spirits during the ritual, the physical leftovers can be eaten by humans. While daily offerings in Bali are usually done by women, for large ceremonies the men get involved by creating enormous offerings that represent the universe. Knowledge and skills are passed on to the younger generation through observation and active participation. 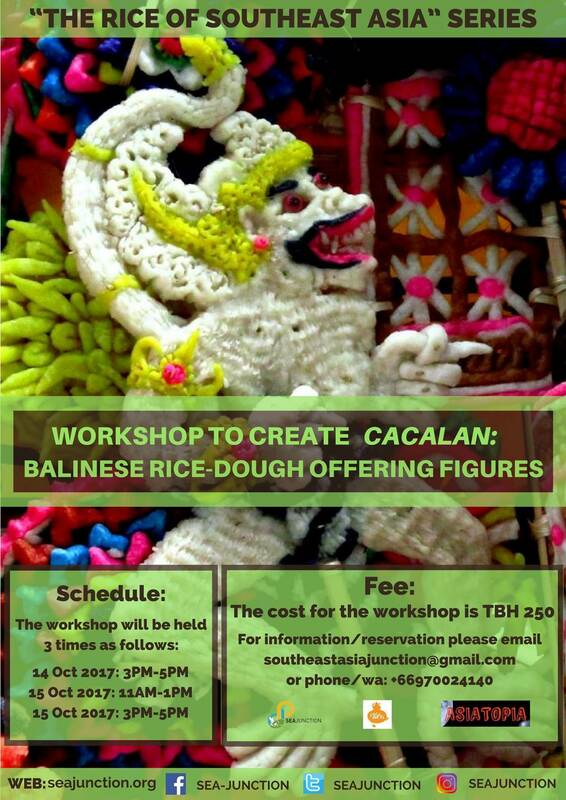 In this workshop, the basic concepts behind Balinese offerings and the cacalan or rice-dough offering figures will be explained and participants will learn to create them. The figures will be made in different colors of rice-dough from a combination of rice and glutinous rice flours. In the hands-on workshop, participants will start with simple symbolic shapes to learn techniques and then move on to more figurative forms such as flowers, animals, and humans. The figures made in this workshop can be taken home and allowed to harden naturally. In Bali, they are also usually fried, but we do NOT recommend trying to do so for practical and safety reasons. On our website, we will also display photographs of the actual creation of caccalan in Bali (see further the website seajunction.org. Garrett Kam, who is presenting this workshop and the author of the photographs on our website, received his bachelor and master degrees from the University of Hawaii. He has been living in Bali since 1987 and became a ritual assistant in 1990 at Pura Samuan Tiga (Temple of the Tripartite Meeting), one of Bali’s most important temples, the first and only foreigner allowed to do so. In addition to blessing worshipers and bearing sacred objects, Garrett also helps in the preparation of offerings. His photographs in the exhibition document the process and product of making rice-dough figures for temple ceremonies. Garrett has given many lecture-demonstrations and dance performances throughout Southeast and East Asia and the USA, and is the author of “Ramayana in the Arts of Asia” as well as many books and essays on Balinese and Indonesian art for exhibitions that he curated. He is currently in Thailand to teach Javanese court dance at Chulalongkorn University. This event is the fourth of “The Rice of Southeast Asia” series, which was launched in May at SEA Junction with a talk on the “Origin of Tai Ancient Culture” by Tongham Natjummong, editor of Siam Rat newspaper, historian, and political commentator, followed by a talk in August by Jittima Pholsawek on rice biodiversity and rice folk tales in Thailand, and in September by a concert of Tarawangsa, rice harvesting music from West Java, Indonesia. The series is organized by SEA Junction in collaboration with Asiatopia International Performance Art and E-Shann Way Magazine and focuses on rice as a core element of Southeast Asian cultures. All dimensions of rice, from culture to science and agriculture are explored in a series of lectures, exhibitions and other events.